The Raspberry Pi can be used to connect vintage computers to the internet. This image shows my preference - A USB wireless dongle and a USB to serial cable. One could also use the serial port of the Pi, but that method is not covered here. The operating system I chose is a version of Debian Linux tailored for Apple II use (search the web for "IvanX" to download a copy with directions), but this Pi distro is also good for most other terminal software-driven vintage computers. Click for larger view. The first thing I attempted was to connect a Digital VT102 terminal to the Raspberry Pi. I used a cabled ethernet conection rather than wireless. I also had a regular display connected to the HDMI port and a wireless USB keyboard attached. Once the VT102 was 100% working I then started experimenting with vintage computers running terminal software. The CBM 256-80 and Apple /// don't really have a lot to choose from, so I was limited in what I could use. Still, I was able to more or less get both of these running well enough to check/send email, Tweet, telnet/ssh, and run command line operations from a linux prompt. Up and running I elimiated the wired internet connection, hdmi display and usb keyboard. It takes a few minutes for the Pi to boot up. 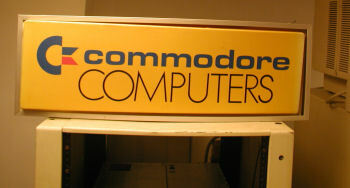 Pictured is the rear of a Commodore CBM 256-80 computer. Note the use of the null modem adapter, this is required to connect to the Raspberry Pi as a terminal. The serial to USB cable connects to one of the two USB ports of the Pi. Click for larger view. The rear of an Apple /// computer and the necessary RS232 serial port connection. Click for larger view. You will need a terminal program that is compatible with the version of Linux you're running on the Raspberry Pi. BeeLine For the B series CBM line provides enough options to allow a connection with minimal garbled characters. It's not easy and a lot of little Linux-y tweaks and experimenting will be necessary to get things just right. I already configured inittab to open ttyUSB0, but I had to noodle with the baud rate and terminal type. See /etc/inittab. I ended up settling on 1200b 7/1/E/N. Click for larger view. Here is a good example of what to expect when you boot. At first, while the system initializes, you may see garbled characters, this is normal. Eventually however you should expect a login prompt. Click for larger view. Here is the Apple III after successful connection. Click for larger view. Apple /// connection, not quite right...more adjustments are needed. I eventually settled on a program called MicroTerminal for the III. Pictured is a screen shot from EasyTerm. Click for larger view. This is the Commodore using the email program mutt to pull email from my gmail.com account. Click for larger view. A few tips...Make sure the terminal is powered on before you fire up the Raspberry Pi so that it will detect that something is on the other end. If you're having trouble, try 1200 baud. That seems to work best for machines that return a lot of garbled characters even if the protocol setting are what you believe to be correct. I'd say start with 1200 baud and use VT52 or VT100 in your inittab for ttyUSB0. Look up legal getty options for terminal types/find an example online. I was not able to find a list of all of the legal emulation names. I am happy to help you if I can. /topic	/t	Displays/edits current topic. Tip: use /t[space][tab] to automatically fill in existing topic. /window close	/wc	Force closure of a window.